I thought the story line was so entertaining, adults would enjoy this movie as well as children. 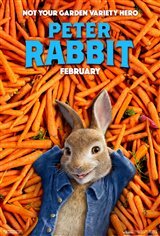 The movie was very much what I thought it was going to be.... Mr. McGregor and Peter Rabbit going at each other. The animation was beautiful; sometimes I forgot that the rabbits were not real!! Our family (8 of us went together) enjoyed it very much! It is such a nice and funny movie. My children wants to watch it again. Such an adorable movie. Will watch again. So funny for the whole family! Love this movie! Went with the kids and was the first time my oldest(10) actually enjoyed going out to see a movie. The rabbit was very funny as the character who was trying to rid off the rabbit. The rest of animals were smart and funny. I enjoyed this movie with my husband and children. Cute. I loved the fluffy rabbit. I will watching this movie again. Loved the story. My kids loved this funny and the same sad movie. No syco people in this movie. Misleading. This was a cute movie. Brought down by the intolerable voice of annoying sycophant James Corden. I took my teenager to see this movie and he loved. This movie is so sweet. Remind me the bear movie I saw couple months ago with Peter from Doctor Who. Great movie!!! I took my granddaughters for spring break, whoever wrote and produced this movie, should get a standing ovation. Fantastic animated movie for the entire family. This movie was great fun for both children and adults alike! The humor came through on so many different levels that it is guaranteed to bring more laughs during a second viewing. It's not possible to catch every humorous exchange and cultural reference on the first viewing! I loved this movie! great for kids and really funny! I would recommend seeing this again! My kids loved this movie. Delightful movie, good for all ages! Fun family movie. Will see it again. Funny entertaining movie. Loved it!